OTTAWA — Just a couple of weeks ago, when an organizing effort first got underway to assist Nebraska farmers, Krista Karhoff of Ottawa Feed and Grain decided she would help. 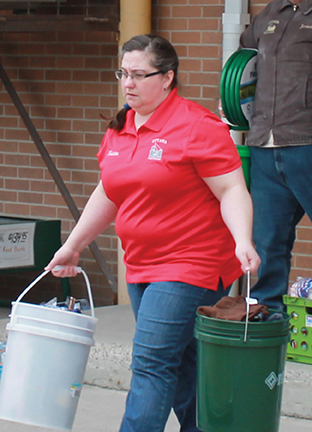 As many hands now experienced in disaster relief quickly came together, Mrs. Karhoff organized the effort to gather much needed supplies locally. Those supplies and a number of volunteers departed Ohio in the early hours last Friday, March, 29 (See, From Ohio to Nebraska). The effort has also continued, Mrs. Karhoff informed The Sentinel that since the effort last weekend, eight Putnam farms have donated additional hay and straw for farmers in Nebraska. It will be part of the Ohio Relief Haulers convoy departing this upcoming Friday, April 5. The hay and straw will be hauled by the Anderson family from London, Ohio. All who have participated in this local, grassroots effort have expressed their sincere gratitude for all that’s been donated.